A study released May 28 by University of California Berkeley economist Gabriel Zucman and two Scandinavian colleagues, “Tax Evasion and Inequality,” demonstrates that global wealth inequality is drastically underestimated in official statistics because of how successful the super-rich are at evading taxes. 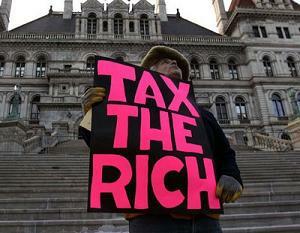 According to the paper, the super-rich, that is the top .01 percent, hide some 25 percent or more of their wealth. This is primarily due to the exploitation of offshore tax havens that allow them to avoid paying taxes where their income is actually accrued, and where they actually live. The study demonstrates, yet again, that the super-rich are a law onto themselves, living in a world completely separate from the vast majority of humanity. Earlier this year, Oxfam reported that only eight men control as much wealth as the bottom half of humanity. However, the findings of this new paper suggest that wealth concentration is even higher. The study’s authors, Anette Alstadsaeter, Niels Johannesen and Gabriel Zucman, rely on several sources to make their analysis. The first and most important is leaked data from HSBC Private Bank (Suisse), the Swiss arm of HSBC, the sixth-largest private bank in the world. The data from HSBC Private Bank (Suisse), which was exposed in 2015, shows how the bank hides billions of dollars of taxable money for corporations such as Google and Amazon, as well as a variety of extremely wealthy clientele. The dirty stream of money exposed in the leak went as high as former US President Bill Clinton, and involved several billionaires and public figures. Another source they use is the data from the Panama Papers, the massive leak of files from the Panama-based law firm Mossack-Fonseca in 2016. Those files showed how the law firm made millions of dollars helping politicians and the super-rich stash their money and hide it to evade taxation. A third source they use is data from Norwegian, Danish and Swedish tax authorities showing households who voluntarily disclosed previously hidden assets in exchange for tax amnesty. Zucman, et al. were able to match assets exposed by the 2015 HSBC leak and the Panama Papers with government data in the Scandinavian countries. This method allowed them to understand the average amount of wealth the super-rich said they had versus what they actually had in undisclosed accounts. The paper showed that in Norway, when offshore assets are added, the Norwegian super-rich show a 30 percent rise in income and the increase is likely to be higher in other countries. “Because most Latin American, and many Asian and European economies own much more wealth offshore than Norway, the results found in Norway are likely to be lower than for most of the world’s countries,” the authors noted. According to the conservative figures of the Internal Revenue Service, which does not cover legal tax havens, $406 billion in taxes are unpaid every year. An investigation into the HSBC leak by the CBS News program “60 Minutes” showed that the Swiss bank run by HSBC had about 4,000 US taxpayers with wealth exceeding $13 billion. The individual tax evasion highlighted in the report, however, is only part of a much broader phenomenon. Tax evasion in the US literally takes place on an industrial scale and is built into the business model of major US corporations. It has been estimated that US firms hold about $2 trillion in cash on offshore holdings largely to escape paying US taxes—an amount roughly equivalent to 14 percent of American gross domestic product. The most prominent example is Apple which holds $240 billion out of its $256 billion in cash reserves offshore in order to avoid paying taxes on this money if it repatriated it. At the same time, it borrows tens of billions of dollars in the US, much of it in order to finance share buybacks and dividend payments in order to boost its share value. The operation of this seemingly perverse logic—borrowing money while having an ocean of cash on hand—is the outcome of policy decisions of the US Federal Reserve since the eruption of the financial crisis of 2008 aimed at boosting the wealth of the financial elite. Its policy of quantitative easing, which has pumped around $4 trillion into the US financial system coupled with the maintenance of ultra-low interest rates, means that Apple only has to pay interest ranging between 1.6 and 4.3 percent to finance operations that boost the value of its shares—far less than the cost in taxes that it would have to pay if it repatriated its overseas holdings. As a result of these and other financial machinations, Apple’s total market value passed $800 billion earlier this year and is well on the way to the $1 trillion mark while the social cost of these operations is borne by millions of working-class families who are deprived of vital services because it is claimed that government has no money to pay for them. Apple, however, is only the biggest example of a process which extends across the corporate world. Among the other big holders of overseas cash reserves are: Microsoft, with $113 billion; Cisco Systems, with $62 billion; Oracle, with $52 billion and Google’s parent company, Alphabet, with $49 billion. These figures underscore the fact that tax evasion and the gains secured by the “malefactors of great wealth” are not the result simply of their individual actions but are the product of an economic and political order of, by and for the rich.